Yeah, it's coming in pink too. And what? Huawei has launched its new flagship 'design-oriented' phone, with top-end specs crammed into a tiny frame. Unlike the Ascend P2, this phone is design-led, but with a decent spec list second. It comes with a 1.5GHz quad core processor with 2GB RAM. Like most Huawei devices, the Ascend P6 has been leaked all over the shop – but it appears to be worth it, with the brushed metal device sporting a 5MP camera on the front of the phone, for even clearer duck-pout shots. 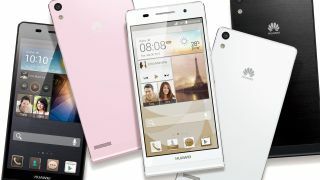 And Huawei is dead set on claiming the World's Thinnest Smartphone title again, with the Ascend P6 coming in at 6.18mm thin. The rear packs an 8MP option, which is less impressive (although does have an f2.0 aperture, which will give good low-light performance), as is the 4.7-inch 1280 x 720 screen, although Huawei has stepped up its game recently with improving the clarity of its displays, with in-cell LCD technology on offer. It's also running the latest version of Android in the shape of 4.2.2, as well as 8GB of internal storage, supplemented by a microSD card slot. Confusingly there's no 4G capability on offer with this handset either, so it's only DC-HSPA on offer for 3.9G (or whatever stupid number they're giving it these days) connectivity. Android has been skinned somewhat – and some may not like the new Emotion UI. It's a simplified version, but takes away things like the app tray, which any user of Android will be used to – but at least there's Dolby Digital Plus in the mix, which mitigates the slightly lower 2000mAh battery. Huawei wants us to believe that its 'unique Automated Discontinuous Reception (ADRX) and Quick Power Control (QPC) battery optimization and power saving technology improves performance by more than 30%'… a theory we've yet to see proven. The phone will be available in white, black or pink (for the men who care about their skin. Not the ladies. That would be sexist), and will be coming to 'Western Europe' in July through most of the networks – although not EE, obviously. Huawei has confirmed that the phone will land priced at €449 (around £380,AU$595) - a fair bit cheaper than the Galaxy S4 and HTC One - and that it will land next month. It will also be coming to Australia, though we haven't heard price specifics for there just yet.